Situated in the heart of the Balkans, Bosnia and Herzegovina remains one of the last great undiscovered regions of the Southern Alps. Its rugged beauty is mostly mountainous, embellished by the lush forests that make up 50 percent of the country. Still peppered with battle scars from the Bosnian war, its heartbreaking history can be found on the wounded soviet-style apartment blocks in its suburbs. Explore the cobbled old town market of its capital, Sarajevo, known as Baščaršija. See the Gazi Husrev-beg Mosque and the Latin Bridge where Archduke Franz Ferdinand was assassinated. In Mostar learn the history and symbolic significance of Stari Most and explore its pretty old town with your Local Expert. 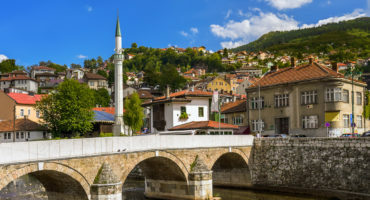 With Insight Vacations gain access to exclusive experiences: • Visit the Tunnel of Hope in Sarajevo and hear a firsthand account of when the city was under siege and the impact of the city’s secret lifeline. When to go: Head to Bosnia and Herzegovina between May and September for the warmest climates and brighter mountain views.